Slowly, I'm reclaiming my fiber tools. After leaving them to stand idle for a number of years, I want them back, both in terms of working order and management. And I also want to reclaim the knowledge and know-how to use them all. A friend kindly told me it took her several years to get her fiber groove back. The news was disappointing, but reassuring. My marudai and table-top weaving loom have made the transition. Today I'm tackling the next to last piece of major equipment--my knitting machine. As mentioned in my last blog, there are few knitting machine manufacturers today. The manufacturer of my machine, Swiss-based Passap, ceased manufacturing 15 years ago. That makes me even more careful about care as parts will be far more difficult to acquire. And the needle spacing (5 mm) is different from the Japanese machines so even stitch transfer tools aren't interchangeable. The refresher course from Susan Guagliumi at Vogue Knitting Live earlier this month was a catalyst. My Passap Duomatic 80, a double-bed marvel, has not seen action in years. The good news, for which I'm grateful, is that it's been stored properly--covered and in the house. It looks pretty good, but I still need to clean off small amounts of oily residue on the beds. The manuals that accompanied the machine (Yes, I have them all!) have only a cursory overview of maintenance. I wanted to better understand the process before embarking on the restoration process. 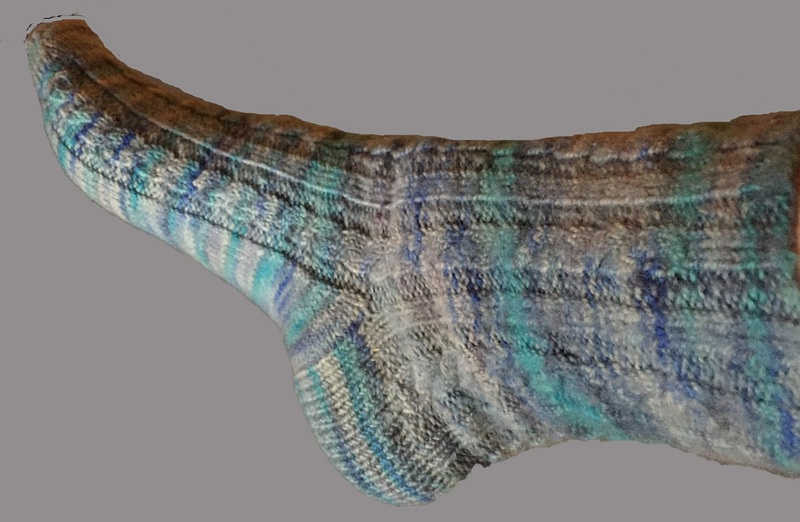 Thanks to online resources, especially The Virtual Online Knitting Machine Museum. The site offers a wealth of information on multiple brands and models, including mine. And it hosts a 19 page pdf, complete with photos, of how to clean my machine. As I researched, I kept finding recommendations for Michael Becker's "Be Your Own Passap Paramedic." A 'must-have,' they said. I ordered it and as I waited for it to arrive, began to assemble the recommended tools and cleaners. I'm now ready. Today is the day I tackle the friendly beast. With four years now under our belts, attendance at Vogue Knitting Live New York has become a very special time for me to learn and be inspired by some of the best knitting instructors in the world. Although Kris and I could make the event a day trip, we splurge and stay one night. This allows us to have two days of classes. I oversubscribed myself....again....with a total of four classes and one lecture. Kris did the same. That meant we had four different instructors. Some were outstanding. More on the topic of teaching another time. The public areas feature special exhibits such as the felted dragon and gnomes (right) and Lion Brand Yarn's produce stand (below). Although some were simply displays, most were devoted to business-minded fiber artists. Some, like Jennifer and Melissa VanSant of Going Gnome, and Ruth Marshall, who hand knits pelts of exotic endangered animals such as the clouded leopard (below), offer kits. The Marketplace grows year over year growing Vogue's revenue streams and offering shoppers a wider range of goods. There is an extensive variety of yarns, tools and supplies in ballrooms on two floors. This year added spaces in an area adjacent to one of the ballrooms. The market is definitely worth visiting, but it gets crowded....as in crushingly crowded. Next year I plan to leave at least one class time open time so that I can spend some time in a less crowded market. Maybe I'll even buy something. Susan Guagliumi's machine knitting refresher class was my first choice among all choices. I had been shut out in past years and looked forward to a morning of immersion. The morning course was exactly what I wanted--and needed. I have a knitting machine--a fabulous Passap Duomatic 80 acquired many years ago. They are no longer manufactured although they're workhorses and plenty are still in use. I found one in the Virtual Knitting Machine Museum that made me feel, well, old. I have long struggled to understand the low interest in knitting machines. Susan Guagliumi, whose knowledge of machines is both broad and deep, attributes the decline to the output of ugly garments knit in acrylic and mostly in Fair Isle. Knitting machines can be workhorses. Sure, they can knit garments--and knit them beautifully if executed properly, but they offer much more versatility than that. I find my machine a perfect companion for finishing hand wovens and it's the perfect tool for hand knit projects with brutally boring expanses of a single stitch type. Now that I'm home, I can't wait to get the machine working. Yes, I have a re-learning curve, but I'm motivated. Really motivated. And after hearing a lecture by Laura Bryant, I think I have the perfect project. Finishing techniques were my other focus for the weekend. This is an ongoing interest as it can make a difference between a garment that looks like it was 'made by loving hands at home' and a hand crafted knit. My class, "Finishing School," with Deborah Newton was excellent. 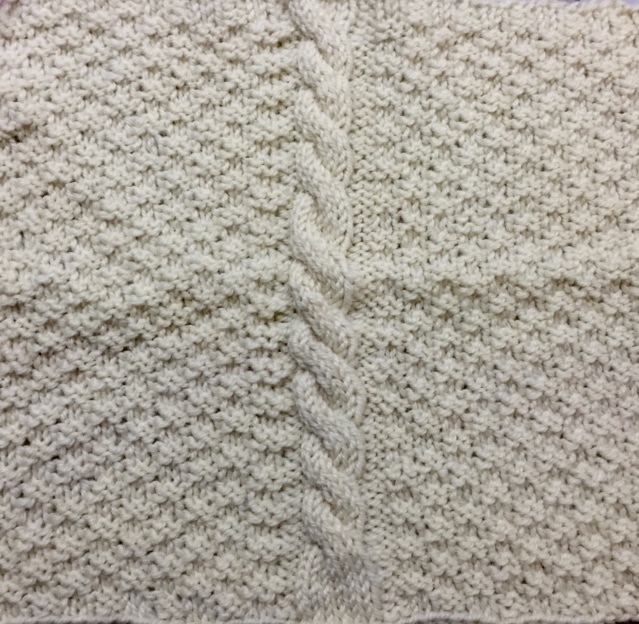 Prep for the class was a large, square, blocked sample that had a cable in the middle with 4 inches of a small all over pattern on each side. 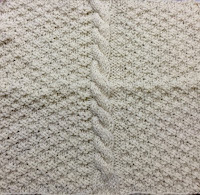 (I used a small basketweave) In class, we practiced her recommended seaming technique on about two inches of it. To get the full benefit of the class, I need to follow through on her directions to try out the other techniques. My biggest take-away is a new perspective on blocking, especially wet blocking. "Blocking isn't necessary," Newton advises. "Maybe a light steam, if the fabric is appropriate." Also, she says she has no special tools and recommends none--a reassuring note in the midst of a market mania. I was so impressed with three instructors that I came home and ordered their books. In addition to Deborah Newton's "Finishing School" and Susan Guagliumi's books on machine knitting, I ordered Laura Bryant's "Artful Color, Mindful Knits: The Definitive Guide to Working with Hand-dyed Yarn," after hearing her speak and seeing the jacket she was wearing. I expected a pattern book, but no! This book is a gold mine for anyone who hand dyes yarn for their craft. The knitting patterns are a bonus. Antique patterns in traditional and designer garments. 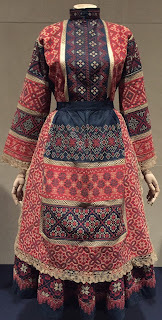 L-R: Embroidered thobe, Palestinian, early 20th C.
Russian ensemble, embroidery and lace, early 20th C.
The Metropolitan Museum of Art (MMA) has a significant collection of textile pattern books. These early examples of patterns form the basis for their current exhibit, Fashion and Virtue. Textile Patterns and the Print Revolution, 1520–1620, around which the curators have tied the past to the present. This show focuses on patterns and specifically on print patterns that were published to be destroyed. Not malicious destruction, of course, but the patterns were intended for use so the pages were typically torn out and used as patterns for all sorts of textile decoration and embellishment, including embroidery, lace, cutwork, etc. Consequently, not many of these pattern books exist. It seems to me that exhibits based on books would be a challenge. A book is a unit composed of individual pages. How do you display a page or two to convey the book's value and importance? In this exhibit, the curators displayed the patterns as worked into finished items--garments, accessories, etc. When I see patterns like this--in books (like Dover's Design Library), on objects and garments of all sorts, and in exhibits like this--I see design opportunities. For example, the print squares with a rose in the centers as well as embroidered design on the smock undergarment on display makes me think of cables. MMA is doing an excellent job of digitizing their collections and making them available online. Click here to view a selection of items in the exhibition.